Deciding to live with your ex-spouse or someone new can be a difficult decision. Living together after divorce can be a difficult decision. 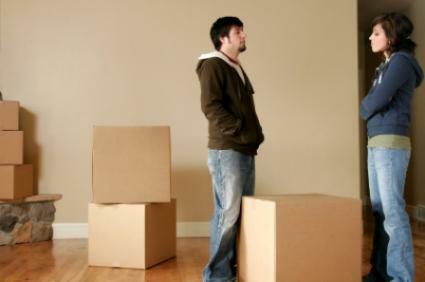 Whether you have decided to live with your ex-spouse or you have found someone new, the thought of taking the step of moving in together can bring back unpleasant memories of the past. Some couples do not want their children dealing with living in two separate households. Many people feel imprisoned when in a marriage. This can cause resentment and arguments. When two people are not married, each of the partners may feel that he or she can back out of the relationship at any time with no strings attached. Instead of paying alimony, couples may decide to live together and split household expenses, which would be much less expensive than living separately. It can be hard to leave a person you have spent many years with and live on your own. Some couples opt to live together without being married so they can still be with that person but also be able to leave if times get tough again. You may be thinking about living with your ex-spouse because you have recently started dating him or her again and want to see if your differences are still present when under the same roof. Spending time with someone on a date and then being able to go home alone is much different than spending countless hours with that person. It's been awhile since your separation from your ex-spouse and you have been in the dating field for a couple of years. You have found someone you really like and want to take it to the next level and move in with him or her. The problem is that you are worried that living with this person will result in the same heartache you had with your ex-spouse and ruin a good relationship. The good news is people learn from their experiences. Your past marriage has taught you things about yourself and what you can and cannot deal with so you know what to look for in the future with someone new. Moving in with someone after divorce can actually be quite beneficial to you and calm your fears if you decide to remarry later. When you only spend a day or a few hours with someone, you really don't know the extent of how annoying some of the person's habits can be. When you live with that person, you will quickly find out what bothers you about the person to the point of not being able to deal with it. Spending more time with someone under the same roof helps you learn more about the person's values and morals. You can see how the person lives and if this is compatible to how you live your life. One of the most common causes of divorce is money issues. If you both decide to split all household expenses equally or divide the expenses in a different manner, you will be able to see how the person spends his or her money and if the person is responsible. Whether you decide to live with your ex-spouse or someone new, a friend or family member may have something negative to say about it. If it's an ex-spouse, a loved one may be concerned you will return to being as unhappy as you were in the marriage. If it's someone new, a loved one may be concerned that you are moving too fast and not ready for another commitment. Listen to your loved ones' concerns but assure them that you have your reasons for wanting to move in with the person. Appreciate they care for you and remind them that it may or may not be a good decision in the long run but you will never know if you don't give it a try. Many loved ones will learn to accept it and support you in your decisions even if they may not agree with them.